Chocolate Cake with Plums, Walnuts and Sour Cream Frosting - Let the Baking Begin! Chocolate Walnut Cake layers frosted with Sour Cream Frosting and Dry Plums, perfect harmony of flavors and all made in under 1 hour! I am so, so excited to share with you this cake. It was a spontaneous play off this Milky Girl cake that I was expecting to turn out well, since the flavor combination was awesome, but it turned out even better than I was hoping for. I don’t know if you know, but I secretly hate cakes that I need to roll out by hand. Well, I like their flavors, but I hate making them. The dough usually sticks, so you need to either keep adding flour or use parchment paper so it gets really annoying. As I was making the Milky Girl cake, I got the idea to switch it up a bit and make it into a Chocolate Walnut cake. I was so excited when it all worked out and the flavor was just so good! The chocolate cake layers are soft, the frosting is tangy (thank you sour cream) but creamy (thank you condensed milk), the walnuts and dry plums cut down on sweetness and just make it all work! 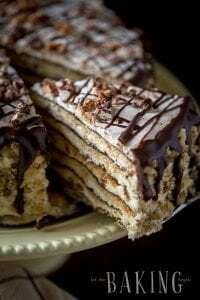 So if you like cakes similar to Spartak, but hate the rolling out of every layer just like me, be my guest and try this cake. All you need to do is spread the batter thinly on parchment paper since it’s runny like pancake batter. I wasn’t going to share this recipe until later, but I’m making it for our Christmas Party this Friday so I thought I’d share anyway 🙂 Enjoy! OR 10.5″ round cake 3.5 inches tall (5 layers). Soak prunes in warm water for a couple of hours if they’re very dry, or for 30 minutes to 1 hour if they’re not, essentially until they’re rehydrated, soft and plump. Drain the water. Chop into small pieces. Set aside. Preheat oven to 375F. With the baking rack in the middle. Combine all dry ingredients and whisk or sift together. Place all wet ingredients (condensed milk, eggs, vanilla extract) in a bowl and whisk until smooth; then add the dry ingredients and whisk until smooth again. Important: To assemble the cake you need a 9 inch round, 5 inch tall spring form. If you don’t have one, just bake wider cake layers (10″-11″) and then you can assemble it without a ring. Draw a 9 inch circle on 2 pieces of parchment paper. Flip upside down. Pour 1/3 cup cake batter and spread around evenly (place the parchment paper on a silpat sheet or something nonskid, to help the parchment paper stay in place as you spread the batter) within the drawn circle. 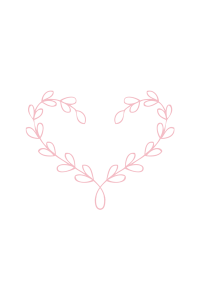 Draw a 10″ or 10.5″ circle on 2 pieces of parchment paper. Flip upside down. Pour 1/2 cup cake batter and spread around evenly (place the parchment paper on a silpat sheet or something nonskid, to help the parchment paper stay in place as you spread the batter) within the drawn circle. Bake for 6 minutes or until cooked through. Remove from oven, peel off parchment paper, and transfer the cake to a cooling rack. Reuse the parchment paper for the next cake layer. Working with 2 pieces of parchment allows you to spread the batter one one piece of parchment paper as the other one is baking. 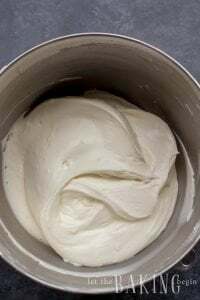 Combine all ingredients in a bowl of a mixer and whip on high until increased in volume and raising the whisk out of the frosting leaves a visible ribbon that does not disappear, about 5 minutes. For a 9 inch round cake: You need to assemble the cake in a 5 inch tall adjustable cake ring or a cake spring form for best results as the frosting is not very stiff and will probably run off the layers as you stack them. If your spring form or adjustable cake ring is not tall enough, you can line the inside of the cake ring with parchment/wax paper/acetate strip 5-6 inches tall, overlapping the ends by about 4 inches to keep the frosting from escaping. Theoretically it’s probably possible to layer the cake without it, but it probably would get a little messy, beware. For a 10″+ cake, you do not need the adjustable cake ring. Place the cake ring in the middle of the board or a cake platter. Put a dab of frosting in the middle of the platter and cover with one cake layer. Fasten a ribbon around the cake ring to fit snuggly around the cake layer. Top with about 1 cup Sour Cream frosting for the 9 inch layers, or a little more for the 10″ inch layers, and spread it around. Sprinkle about 6-8 chopped prunes over the top. Repeat with the remaining cake, frosting and prunes until no more cake remains, putting the last cake layer bottom side up and covering it in only a thin layer of frosting and no prunes. Refrigerate the cake and the remainder of the frosting for 2 hours before removing the cake ring off the cake. Unmold the cake from the cake ring and cover it in the remaining frosting, concentrating mainly on the sides of the cake and not the top. Prepare 1/4 cup ganache, bring it to room temperature, fill a ziplock bag with it then with the same motion as you would write letter M with (going up and down about 1/2 inch) make a drizzle around the edges of the cake. Sprinkle 1/2 cup of chopped walnuts over the top of the cake. Place a couple green twigs from a christmas tree branch over the cake if decorating for a Christmas or New Years. Looking for more Cake inspiration? 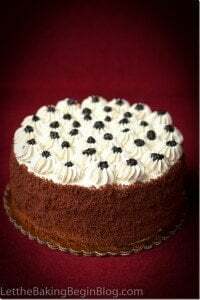 Chocolate Poppy Seed Cake – Chocolate and poppyseed cakes with a sweetened condensed milk buttercream. Marina’s Bird’s Milk Cake – Moist Chocolate Cake filled with Luscious Custard Cream. 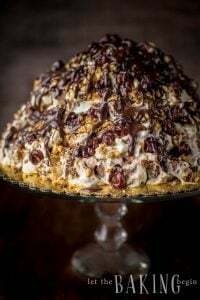 Kiev Cake – Soft Sponge layers sandwiched with Peanut Meringue & Sweetened Condensed Milk Buttercream. Soak prunes in warm water for a couple hours if they're very dry, or for 30 minutes to 1 hour if they're not, essentially until they're rehydrated, soft and plump. Drain the water. Chop into small pieces. Set aside. To assemble the cake you need a 9 inch round, 5 inch tall spring form. If you don't have one, just bake wider cake layers (10"-11") and then you can assemble it without a ring. Draw a 10" or 10.5" circle on 2 pieces of parchment paper. Flip upside down. Pour 1/2 cup cake batter and spread around evenly (place the parchment paper on a silpat sheet or something nonskid, to help the parchment paper stay in place as you spread the batter) within the drawn circle. You need to assemble the cake in a 5 inch tall adjustable cake ring or a cake spring form for best results as the frosting is not very stiff and will probably run off the layers as you stack them. If your spring form or adjustable cake ring is not tall enough, you can line the inside of the cake ring with parchment/wax paper/acetate strip 5-6 inches tall, overlapping the ends by about 4 inches to keep the frosting from escaping. Theoretically it's probably possible to layer the cake without it, but it probably would get a little messy, beware. For a 10"+ cake, you do not need the adjustable cake ring. Put a dab of frosting in the middle of the platter and cover with one cake layer. Fasten a ribbon around the cake ring to fit snuggly around the cake layer. Top with about 1 cup Sour Cream frosting for the 9 inch layers, or a little more for the 10" inch layers, and spread it around. Sprinkle about 6-8 chopped prunes over the top. This is the second time im making this cake and both times my sour cream frosting is too runny. What am i doing wrong? The frosting is not meant to be thick and pipable, because it is supposed to be thin enough to allow the cake to be moistened by the cream. I usually buy the 40% cream, what kind do you get? If you’re getting just the regular whipping cream and not the heavy cream (regular cream 30% fat content, heavy whipping cream is at least 33% fat content), then there’s not enough fat content in the cream to hold it’s shape. Does this make sense? Yes Marina! That might be my problem. I’m getting regular heavy cream. It was so thin that it basically dropped off the cake but I saved it and it was fantastic. My family’s favorite. Thank you!! Also, if you’re into baking, you might want to get yourself a cake ring like you see in my pictures. It is really good for assembling cakes, because even if you have a runny frosting, if you have the cake ring it will help your frosting to stay in place instead of running off. I believe I included a link to Amazon, where I got it from. If you’re using regular heavy whipping cream (it is at least 33% fat) than it should be ok. Are you sure you’re whipping the heavy cream long enough? I mean, you don’t want to overwhip it or it will separate and become runny, but if you under-whip it, it will be too thin to hold on to other ingredients that are added to the cream. Oh boy, what a joy ! So happy to find this…. have a pleasant day ! Marina, i am about to make this cake and it looks like you added the eggs to ingredient list in the frosting instead of the cake. I don’t know how it got in there lol. Fixed it. I made your no-bake honey cake layers and used the sour cream filling from the Chocolate, walnut and plum cake and used walnuts and plums over the filling in each layer. I made it for my niece’s birthday today as a surprise so will post later today on Instagram. I will hashtag it with letthebakingbegin. I have been wanting to do it for such a long time now, I even bought the chocolate graham crackers that have been sitting in the cupboard for almost a year haha! Tell me how you like it once you try it! Did you do regular graham crackers or chocolate? I changed it in the recipe, but the app for the print version was acting up for a long time. I fixed it in the print version now and I think it shows up correctly, finally! Hello, what other dried fruits can i use instead of the ones mentioned above? You can use dry apricots, or tart cherries, or even fresh raspberries. Anything that has a bit of tartness will work here. If I wanted to make this as a rectangle cake, which size pan would be appropriate for this recipe? You would use an 8×8 pan. The cake looks really impressive and easy, so I decided to give it a try for tomorrow’s New Years party. My question is when is the best time to make it: today (Wednesday) or tomorrow??? Thanks! It’s best to make it 12-24 hours before you need to serve it. Hope you like it, Natik! Happy New Year to you and your family! Your cake recipe does not mention any vanilla extract in the cake batter but in the directions you mention adding vanilla extract in the wet ingredients. Is there vanilla in the cake batter? If so, how much? Thanks! Hi Yana, if you have vanilla extract add 2 teaspoons to the batter. If you don’t, you can omit it. It always adds a nice aroma to the cake when you add it. You are so amazing and so talented!!!! Thank you!!!!! This is my favorite cake, I can’t wait to try it!!!!! 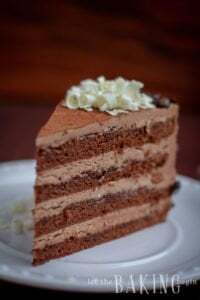 Oh this cake looks wonderful, Marina, I love the fact that it has so many layers and looks so impressive but in reality not difficult to make! I can’t wait to give it a try! Merry Christmas, my friend! Thank you Julia! Merry Christmas to you too! It’s almost your birthday too, eek! I think you missed to mention how many eggs you used in this recepie? Otherwise it looks like a very delicious cake, I think prunes give this wonderful taste to any sour cream frosting.